In June we embarked on the gorgeous sites of North Devon. We booked a static caravan at Woolacombe Bay Holiday Park. The company has a handful of sites, fairly close to each other, and you can visit and use facilities on all the sites when you book a holiday. We chose the Golden Coast resort for a Monday to Friday five day stay. Typically with it being the start of the English summer, the first four days were incredibly grey, drizzly and pretty drab. But we donned the raincoats, went on a few coastal walks with Zac in the carrier, and tried to pretend we were in the Caribbean. We went for a holiday park to get the whole English family holiday vibe, and what you’re picturing is just what it was – tacky evening entertainment, kids playing out by their tents and caravans in the evenings, makeshift bbqs on the go. Onsite swimming pools, a pub, a bowling alley, indoor soft play, a pottery barn and a supermarket meant that we would hardly have to go off the complex if we didn’t want to. But we’re not hermits and hadn’t travelled four plus hours to stay in the park all week, so we did a few days out including Combe Martin Wildlife & Dinosaur Park and trips to Illfracoombe, Barnstable and Woolacombe Bay itself. On the fourth day of our holiday, we took a look at the weather forecast and couldn’t quite believe what we were seeing. England was set for a heatwave – as we were packing to go home! Trying to make the most of it, that evening we booked a other three nights at the neighbouring site of Twitchen House. 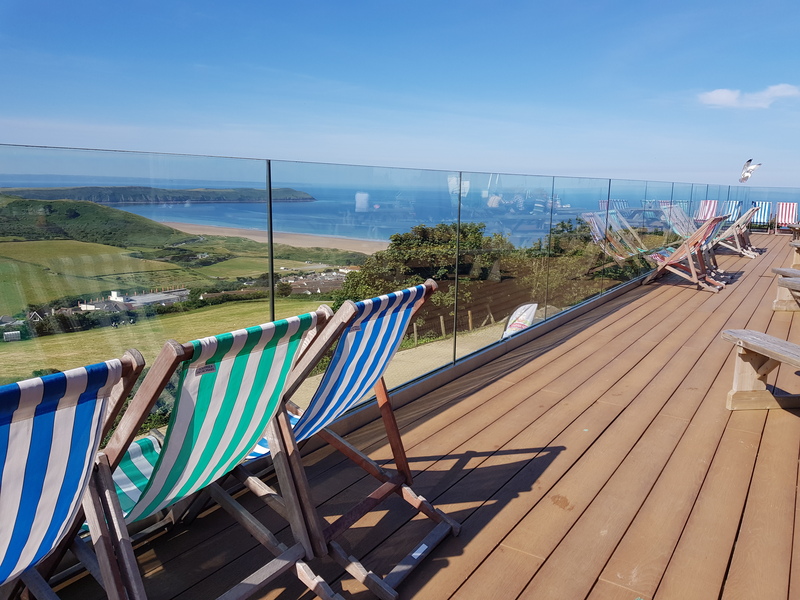 I would really recommend this site for anyone with small children, it was slightly less tack and a bit more tranquil, with gorgeous views over the coast, a lovely outdoor pool and newly refurbished pub restaurant. Whilst we were there England were playing in the World Cup, and the match was put on the big screen which was great fun. Having played football for girls’ and womens’ teams in my time I absolutely loved being able to watch the match in a lively atmosphere, without the fear of a rowdy drunkard throwing his pint on my head whilst falling on the baby. I also dabbled in a game of evening Bingo. I befriended Margaret and Dennis (who the previous evening had won a full house and a couple of hundred quid) and had a laugh whilst daddy had Zac. More football on the screens in the pub, my boyfriend was in his element. We spent the first part of the holiday with Nanny, and to have a helping hand for those first few days was invaluable. Being in a self catered caravan but also having restaurant and takeaway options on site ticked all the boxes. This was the perfect first holiday for us as a family, being able to pack the car with all the baby gear, no worries of getting to the airport on time or flying. It’s definitely worth upgrading your caravan for that bit of luxury(! ), baby carrying if you can as the coastal paths and sand is tricky with a buggy, and packing for both snow and 30 degrees as you can see in our pictures! P.s – the pictures get significantly better as the week goes on and the sun comes out!